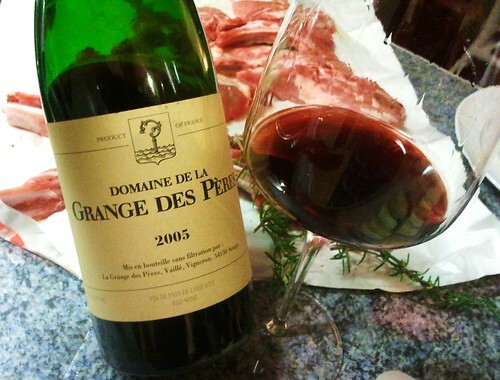 Domaine de la Grange des Pères, founded by Laurent Vaillé doesn’t even have a website, but is considered by many as the Grand Cru of the Languedoc. Also, it is a rather young estate: its first vintage only came out in 1992. I had quite a few wines from this region, also because I lived in Montpellier for 3 years, but never got in touch with the allegedly real big wines then, student budget obliging. This one is made of 40% Syrah, 40% Mourvèdre and a minor part of Cabernet Sauvignon. My notes: elegant ruby-red color with a nice shine, slight forest floor in the nose, wild forest berries, subtle garrigue herbs, palate displays silky texture, melted tannins, good flow, sweet forest berries fruit, slight leather notes, good balance, a tiny bit of cooked fruit impression, medium-long and elegant finish all on the silkiness of the texture and with berries and a pinch of pepper, A gentle power pushes the wine over the palate. A nice wine, that went particularly well with some grilled lamb chops. Many say its style is closer to Northern Rhône wines. For me it is somewhere in between Languedoc and Rhône, and it certainly has a Burgundian aspect to it with that elegant balance.